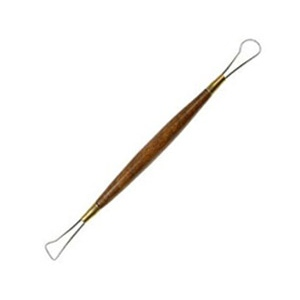 * This finely crafted sculpting tool, from our series of traditional clay modeling tools, has heavy duty wrapped wire ends. * One of our most popular tools wire ends are made with sharpened steel with varied cutting edges. * Each end is also uniquely shaped providing the sculptor with modeling and cutting options. * The wire ends are secured to a wooden tapered handle for ease of manipulation. * Primarily used for texturing in clay modeling and for plaster work.